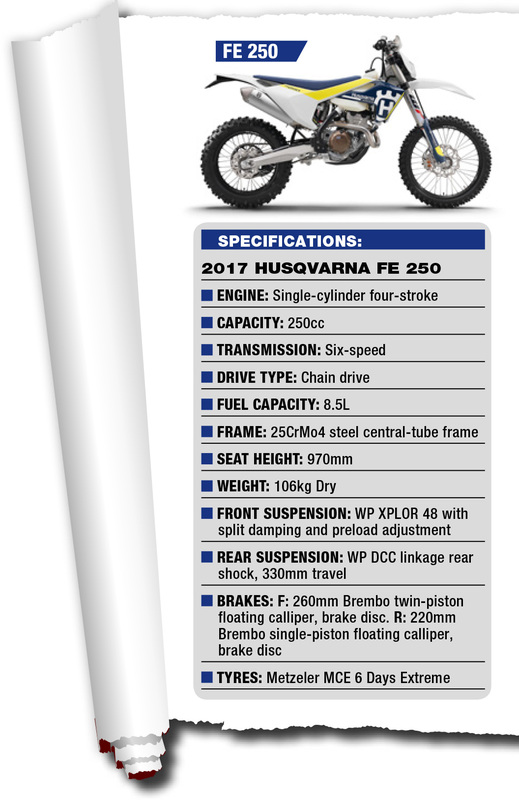 IN 2017, Husqvarna has taken on a whole new approach to its FE (four-stroke) and TE (two-stroke) enduro range, heavily basing them on its motocross machines. With changes such as a totally-redesigned frame, a more compact engine, new front suspension in the way of the new WP XPLOR 48 series forks, a lighter carbon-fibre reinforced polymer sub frame, three-stage traction control system, the four-stroke range is very much leading the way in dirt bike technology. For the die-hard two-stroke enthusiasts, comprehensive engine changes including a redesigned balancer shaft to reduce the vibrations two-stokes have been known for across the board make them easier to get the best out of. Click each bike to see studio image. Scroll down to see the launch video. All of Husqvarna’s 2017 FE enduro machines feature a redesigned engine aimed at reaching new levels of performance and reliability. Focused on providing enduro-specific and rider-friendly power characteristics, all the engines are lighter and more compact than earlier models. The traction control system is fitted as standard, allowing for further adjustment of engine characteristics, so riders now have a tool which goes a long way to cope with their ability and the off-road conditions they throw at their machine. A new 42mm throttle body sees its injector placed to provide an even more efficient flow of fuel to the combustion chamber. All four-stroke models are also fitted with updated header pipes and shorter mufflers, which are now placed 50mm closer to the engine. The gearbox with enduro-friendly ratios now has a gear sensor that allows for specific engine mapping for each gear. These engine updates range from new crankshafts to newly designed cylinder heads derived from Moto3, while there are also significant weight savings, ranging from 700g to 1.7kg through the various models in the new 2017 FE enduro range. Since I haven’t ridden an enduro bike for quite a decent amount of time I thought it was a good idea to start on the little brother of the FE range, the FE250. With its new chassis, new engine and lighter weight, this bike is a gem. Generally when I look at enduro bikes I look straight past the 250 because of my size. I have always thought they would have been a bit small and would have opted for something along the lines of the 350, but man was I impressed. It has great handling, the new WP XPLOR 48 series forks work a treat and the new engine has plenty of poke. I liked the fact I could ride it hard without being intimidated or getting loose and tired. Whether you’re a novice enduro rider or someone who has a lot of experience who is looking for a small-bore four-stroke you should seriously look at one of these. Next up was the FE350 and after a lap on the enduro loop Husqvarna laid out I can understand why this size of engine is king of the kids and everybody wants one. It has the perfect balance between power, weight and ease of use. The FE350’s engine has the delivery and throttle response of the 250, but with broad tractable performance rivalling a 450. For 2017 the engine weighs 700g less than the previous design and is also 20mm shorter. The FE350 features the new six-speed enduro-only gearbox and the low friction shifter fork coating makes gearshifts effortless, even when charging up steep rocky hills. With the help of these and the new traction control system, you can predict this size of bike is going to be at the forefront of enduro bikes for many years to come. I was able to then ride the FE450 and FE501 back-to-back. These machines are absolute weapons. It was on these two machines you could notice traction control the most. On the 250 and 350, traction control seemed like a nice addition for someone who might need it – nearly everyone below an expert level racer will benefit in at least some conditions by having this new technology on the 450 and 501. As a clubman-class rider, I found the traction control awesome on the new FE450 and FE501. Even though I was able to feel like a wheelie king with it on, the traction control was a big help in sticky situations, preventing the bike from spinning out and doing a 360 everytime you get on the gas or climbed up steep rocky hills. As with the rest the new Husky enduro range, the two biggest of the bunch also score the new frame, more compact engines, WP XPLOR 48 forks and so on. Next on the agenda are the new TE250 and TE300 oil burners. Two-stroke enduro bikes have fallen from favour in general over the last decade or so, but with these new machines they might convert some people back. For 2017, 90 per cent of Husqvarna’s two-stroke enduro range is brand new, sharing almost all the updates the TC (motocross) and TX (recreational rego) two-strokes received. The “E” in TE represents enduro in the Husky line-up so the all-new engine uses a six-speed gearbox instead of five. Like the TC and TX, the clutch is 4mm higher (out of the oil for less drag) and the crankshaft is 19.5mm higher, moving mass closer to the centre of gravity. The cylinder head has new transfer and exhaust ports. One of the coolest features to the new 2017 two stroke engine is the counter balancer, which Husqvarna claims reduces vibration by more than 50 per cent. Another great thing about these bikes is they are still fed by a an old-school carby, in this case a new Mikuni TX 38. Also the TE250/350 comes standard with a map switch on the right side of the handlebars. Setting ‘1’ is standard while setting ‘2’ is less aggressive and more suited for slippery conditions. For me the TE250 was simply the most fun bike to ride on the day because it had enough poke for it to be a whole heap of fun without being ‘too much’. It felt almost like a big wheel 85 on steroids allowing you to chuck it around wherever you wanted and it was so easy to ride. The 300, despite only being a little bigger in capacity, was quite a different animal. This is a seriously fast machine and will even test the best of riders. Although there are numerous changes to the 2017 TE enduro range, reducing the vibration like with counterbalancing has made the biggest difference to the ride. After a whole day riding these mega-machines, I can say they are far from being just ‘different-coloured KTMs’. Although there are similarities, the new bikes feel like they come from a manufacturer of their own again, and a seriously impressive one at that.